To display wind direction and wind speed, add our precision-crafted Anemometer. 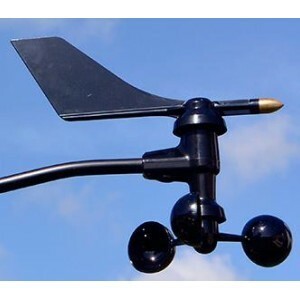 Includes both wind speed and wind direction sensors. Rugged components stand up to hurricane-force winds, yet are sensitive to the lightest breeze. Vane is hand-balanced for optimal stability and accuracy. Sealed stainless steel ball bearings for long life. Comes complete with 12 m standard cable and the hardware needed to mount it on a pipe, wooden post, antenna mast, or similar structure.